A resource for nurses to offer patients who may be considered frail. No older person likes to be labelled ‘frail’. Many view it as a permanent and declining state, linked with a loss of independence and control over their own lives. Yet while the words ‘frailty’ and ‘older’ are often linked – and the risk does increase with age – becoming frail is not irreversible, nor is it an inevitable part of growing older. And there is a lot you can do to stay well, keep involved with family, friends and the community while continuing to enjoy life well into later life. Continuing to lead an active life in your own home for as long as possible is most people’s goal. If you have any long-term conditions, such as diabetes or arthritis, understanding more about them, and how to manage their effects yourself, helps you to feel more confident. Your local health centre should have written information that you can read at your leisure. To improve your comfort at home, councils offer a wide range of help, although most charge for services. Support includes personal care, cleaning your home, preparing meals, fitting equipment and adaptations, and attendance at a day centre. There are also voluntary organisations, such as Age UK and the Royal Voluntary Service, who may be able to give you a helping hand with tasks such as gardening, housework and shopping. Eat healthily, including lots of fruit and vegetables in your diet – experts recommend at least five portions a day – and don’t skip breakfast. Drink plenty of fluids, so you don’t get dehydrated. The recommendation is six to eight glasses every day. If you have urinary problems, drink normally as reducing liquid intake usually makes incontinence worse, not better. Achieve and maintain a healthy weight. If necessary seek help with this from your GP or practice nurse. Do simple, regular exercise. Being physically active may improve health for some who already have diseases and disabilities. Choose something you enjoy – walking, swimming, gardening, cycling or dancing are all good options. It’s never too late to start being more active and you can even do exercises while sitting in your chair. If you’re at risk of falling – for example, have weak legs, poor balance or some medical conditions – do exercises that improve your balance and coordination twice a week. Examples include yoga, tai chi and dancing. Stay socially and mentally involved too. Join a club, see friends regularly or take up a new hobby. Try to do something every day, and plan things to look forward to. Have regular eye checks, seeking professional advice if you think your vision is getting worse. Get your hearing tested (it’s free). Treatment is more likely to be effective when problems are identified at an early stage. Make some simple changes to try to prevent falls. For example, get a non-slip bathmat; keep your stairs clutter free; use plug-in nightlights if you need to visit the toilet in the dark; and coil up any long or trailing electric leads. If you take any prescribed medicines, your GP, a nurse or pharmacist should review them at least annually. It’s also important to have your free flu jab every year, as the vaccine differs each season to combat the most common strains of flu. Keep warm in the winter – an inexpensive room thermometer will let you know if the temperature has fallen below a safe level. Be open to offers of help, or suggestions for equipment or adaptations. Recognising that you need some support can help you to live independently for longer. How can nurses and other health professionals help? Often older people and their loved ones who care for them may feel reluctant to seek support. There can be a fear that a request for help will prompt an invasive response and lead to a loss of independence, with admission to a care home being the likely outcome. But in reality healthcare professionals, including nursing staff, are more likely to suggest some simple and practical ways to help maintain your self-reliance. This might include arranging adaptations such as handrails to be installed in your shower or on the stairs; putting you in touch with a local voluntary organisation that can help you to meet people and get out and about more; or suggesting an exercise programme designed to help you improve your balance, strength and overall fitness. There are a whole range of different nurses who can help you look after your health. These include those who work in your local family doctor’s surgery. For example, they may give you your annual flu jab or check your blood pressure. You may also see nurses who specialise in looking after older people, including advanced nurse practitioners and nurse consultants. These highly skilled and expert nurses carry out care that was once traditionally performed by doctors, for example, helping to diagnose your health problems, ordering and interpreting tests and prescribing medicines. 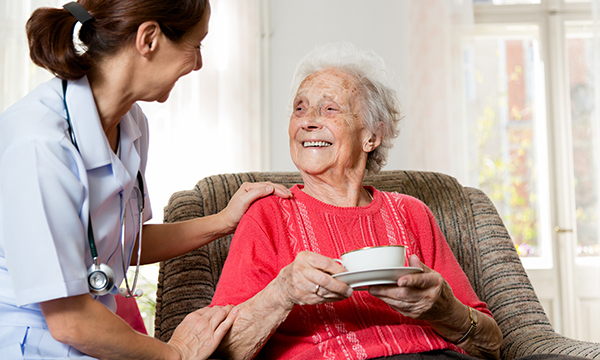 A nurse or other healthcare professional may suggest that you have a ‘comprehensive geriatric assessment’ (CGA). Despite the rather off-putting title, CGAs can be valuable. For example, by helping to identify any health issues or areas where you are struggling – for example, going shopping, getting up and down stairs, or keeping yourself clean – healthcare professionals can offer solutions to make your life easier. Indeed research shows that having a CGA may actually increase someone’s ability to live more independently, staying in their own home for longer, and reducing the number of times they may be admitted to hospital or a nursing home with a health crisis. Different health and social care professionals will be involved in your assessment, including an experienced specialist nurse. Others include a doctor who specialises in the medical care of older people; a social worker or nurse who manages care services; other therapists, for example, occupational or physiotherapists; and you, your family, carers and friends. They will ask questions about many aspects of your life to help build as full a picture as possible, so they can suggest the best ways to help you. Any physical symptoms you have, including any pain, and underlying illnesses and diseases. Mental health symptoms, including any memory loss and your overall mood – for example, do you regularly feel sad? How you are managing the daily activities of life, such as washing and dressing, going to the toilet and getting around. How you are coping with activities such as cooking, shopping, talking to others and using the phone. Any support you are already getting, for example, informal networks of family, friends and neighbours, and also more formal support, such as carers, meals on wheels or day care. Your home, its comfort and facilities. Being able to get out and about, including using local transport. Any social activities you may be involved with or have had to give up. Your own ways of coping. Once the CGA has happened, healthcare professionals will develop a bespoke care plan, tailored to your specific needs, wants and priorities, aimed at improving the quality of your daily life. Charity Age UK asked a selection of older people to share their thoughts on what it means to be frail. For more information on Age UK’s research into frailty in later life, click here.